How to Document SCCM Settings every month? 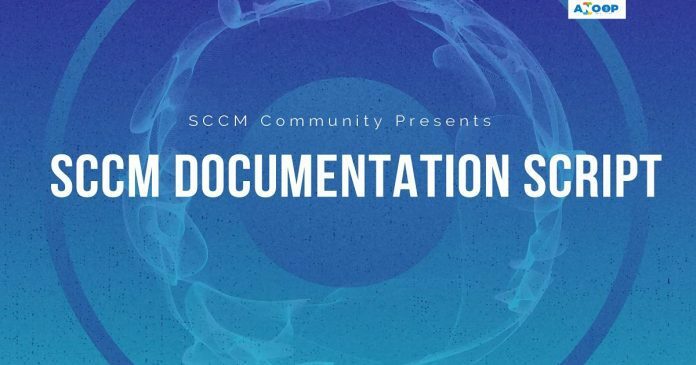 This post is a quick post to give a review of SCCM documentation script. David’s script helped many of us from disasters. I have shared one of my experience in the following section. I have explained that in one of my previous post here. What will happen when someone accidentally deletes all your SCCM CB boundaries and boundary groups? Your SCCM CB infrastructure is useless without boundaries and boundary groups. One of my colleagues had SCCM environment documentation which he took with the help of David O’Brien’s script. The SCCM documentation helped us to start the recovery process of SCCM boundaries and boundary groups. This video review will give you an overall idea about the script. How to run SCCM documentation script? What are the SCCM documentation script options available? etc… How to take the documentation of your SCCM settings automatically? As per Paul’s blog here, there are 17 enhancements. My favorite improvement is that he removed the dependency of Microsoft Word. David’s script had a prerequisite to have a word installed on the server or machine where you run the script. Paul’s enhancement to the script removed this dependency! *	Removed dependence on Microsoft Word. *	Updated to work with Current Branch (1710+). *	Collects everything for Software Updates (ADRS, Config, Packages, Groups)!! *	Collects important Info for SQL database. *	Collects Site features and servicing history. *	Collect Default Boundary Group settings. *	Extended to include configuration of all the new Client Settings. *	Collects additional Collection information. *	Summarizes Collections with maintenance windows. *	Summary of all the different Compliance settings (Conditional Access, Company resources, etc). *	Updated Endpoint Protection Profile info. *	MUCH more detail on Applications. *	Lists Task Sequence steps. *	Summary or detailed options. Following are sample command lines which can be used to run SCCM Documentation tool. Example – use cases or scenarios of SCCM Documentation tool. This will document everything with detailed information. Will make a very large file! This will document everything with detailed information. It will also embed a custom logo from the provided URL into the cover page. This will document everything with summary information, a custom logo, and a custom Author and Vendor. DocumentCMCB.ps1 -CompanyLogo 'http://www.contoso.com/logo.jpg' -Author "Bugs Bunny" -Vendor "Acme"
I would recommend reading Paul’s post here before downloading the script from GitHub. SCCM Documentation script helps to document your entire SCCM environment. If you have an SCCM CAS hierarchy, then you have to have proper access to all remote WMI servers. All primary, secondary site servers documentation is going to take long time depending on the network connectivity.